Does imitating a teacher limit children’s exploration during play? It is no surprise that children learn quickly by watching others, but previous research had shown that children are also good at spontaneously generating their own evidence during play. This study asked: How do children’s desires to imitate a teacher affect their ability to learn on their own during play? Children, aged 4-5 years, played with a novel toy in order to figure out how it works. The toy had four hidden causal properties: a tube that made a squeaking sound when it was pulled, a button that turned on a light, a mirror hidden inside another tube, and a pad that played music. 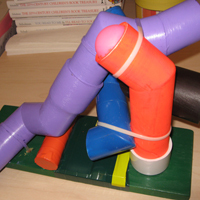 In one condition, the researcher first demonstrated one of the causal properties of the toy – she made the toy squeak by pulling on the tube. In another condition, the researcher either “accidentally” discovered the same property of the toy, or was interrupted while she was demonstrating how the toy worked. In a third condition, children received no demonstration – the researcher simply looked at the toy. In all conditions, children were then allowed to play with the toy on their own. After playing, children were asked to demonstrate the different causal properties of the toy. We predicted that children who received no demonstration would discover most of the causal properties of the toy on their own. However, we predicted that children who had seen a demonstration of one of the toy’s functions would imitate only the action demonstrated, and would be less likely to discover the other properties of the object. Children in this condition might assume that their “teacher” showed them everything that the toy could do. We found that children notice when others attempt to teach them about how things work, and that they use information provided by adults to guide their explorations of the world. Children in our study spent less time playing with the toy when the researcher demonstrated how it worked, compared to when the researcher discovered the same property accidentally or when she was interrupted before she could finish the demonstration. This was true even when children simply overheard the researcher demonstrate how the toy worked for another child. Children who didn’t receive any demonstration played with the toy longer, and discovered more of the other properties of the toy. This research shows that when adults give explicit instructions to children, kids often imitate only the actions demonstrated. While this is a valuable skill when children are in classroom settings, they may learn more through free play when adults allow them to explore objects on their own. Use the Electricity Exhibit on the second floor of the Discovery Center to create a circuit with your child. Can your child figure out how to connect the pieces to make a light bulb glow brightly, a motor spin, or a buzzer beep? Does your child try to imitate what s/he sees others do, or prefer to explore the toy on his/her own? If you show your child one possible circuit, can they draw on this demonstration to figure out how to make a different circuit? Introduce you child to a toy s/he has never seen before and observe how many different ways s/he uses this toy. Let your infant explore the toy independently at first. Then show your child a new way of playing with the toy by demonstrating something the toy can do, and allow your baby to play on his/her own some more. Does your infant mimic your actions with the toy, or do they continue playing with the toy in other ways ? If you then play with the toy in different way, does your infant imitate this new action?